Highlight wetlands easily throughout your bird garden with these Heritage Farms Cattail Staked Bird Feeders. These 3, sculptural feeders perfectly mimic cattails, and bring a wonderful theme to your landscaping in moments. A steel shaft with leaf shapes creates the base of each unit, while an oblong, mesh reservoir completes the effect. This section of each feeder holds 0.25 quarts of peanut chunks, and sports a 0.25" square mesh for smaller birds to cling and dine. A brown, powder coated finish on the units enhances their realistic look, along with leaf shapes which extend from the center shaft. Group these feeders together in your garden to evoke a pond edge, or spread them throughout it for a different effect. The pointed base of each stake inserts into soil in moments, and the top of each cattail unscrews for refilling the feeders. Crafted from durable steel, these units will remain usable and sculptural for many seasons. 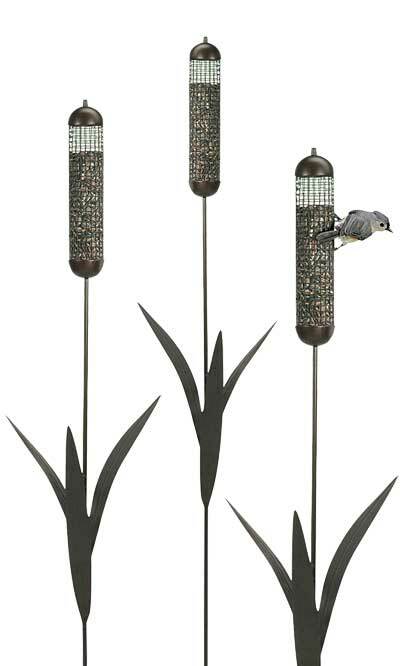 Bring your love of wetlands into your bird garden using these Cattail Staked Bird Feeders. Note: This case pack contains 3 of the Heritage Farms Cattail Staked Bird Feeders.